Being parent-run and non-profit, Gecko Garden Preschool welcomes, values, and fosters parent participation in school life. Research shows that children make significantly greater progress when their parents are involved in their learning. To enable this we have an open-door policy regarding parental involvement in the classroom. In light of the contribution parents make to the school every effort is made to keep fees low relative to other international preschools in Phnom Penh. In return, active parent involvement is not only encouraged, but expected. Parents are welcome to join the PMG and become directly involved in matters of school direction and policy. Members are expected to attend monthly meetings and participate in project work throughout the year, which may include working on sub-committees, organising events and participating in recruitment exercises. It is not necessary for PMG members to have a teaching qualification or a teaching background – the main qualification is interest in supporting the success of Gecko Garden Preschool. Come and read your child’s favourite story, lead a music session or a craft activity, introduce a hobby or a skill to the children, or celebrate a national holiday or cultural event from your home country. Talk to your child’s teacher – they always have ideas about ways you can get involved that relate to weekly themes or special interests. Help out at school events such as coordinating a game at the Halloween Party or setting up a stall at the annual flea market. Join a working group for special projects around the school such as upgrading the paintings on the walls or re-organising the library. Parent volunteers are needed every other Wednesday to supervise our full-time students during their lunch hour while our staff participate in professional development training sessions together. Share ideas for social events, learning opportunities or anything else with your child’s teacher or class parent. Parents are free to talk to teachers about their child’s progress at any time, while structured parent-teacher conferences and written reports also occur regularly during the school year. Just as Gecko Garden Preschool creates a nurturing and safe environment for children to explore and grow, we also foster a welcoming community and network for parents. Getting involved is a great way to meet new people, feel connected in the community and engage in your child’s learning journey. "After taking a short detour with another preschool we opted to enrol both of our girls at Gecko Garden Preschool, which definitely turned out to be the best decision. We immediately felt the warmth of the school as we stepped in. The lovely teachers, the size, as well as being parent-run gives a super homey feeling, where my girls love to come every day. We particularly love the creativity of the teachers with arts and crafts – I am surprised every day with a new masterpiece brought home." "The first thing that hits you when you walk through the Gecko Garden Preschool gates is a massive wave of warmth. There is a sense of belonging, a feeling of joy, and the sounds of happiness resonating from behind those magic gates that warms our hearts. To be able to leave our child (and soon to be our children) in an environment where they are not just nurtured, but loved as well, is a testament to how everyone in the school truly believes in what they do. Kudos and thank you everyone at Gecko Garden!" "To be honest I didn’t search extensively for a preschool for our child. As soon as we entered the school I could tell that he would be happy growing and developing here with such an experienced group of teachers. Being a parent-run school also gave me the satisfaction of knowing that my child would be growing up in a community and not just another child in a system." 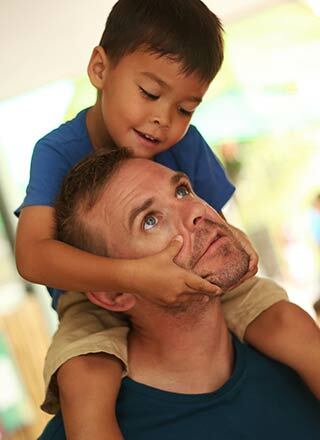 "Of all the things we love about Phnom Penh, Gecko Garden Preschool is at the top of the list! Our son is thriving with the guidance and encouragement of his wonderful teachers and teacher assistants. He loves going to school! We love being part of this amazing community of talented teachers and dedicated parents." "It’s the most wonderful feeling when your children are excited to go to school. Gecko Garden Preschool has been a second family for our children. I trust the staff 100% to care for my kids the way I do." "The instant we walk through the gate we feel this warm and welcoming atmosphere, so different from my previous experiences! I also love that I can be so involved in my children’s first years in school. I won’t have that chance much longer!" "We couldn’t be more pleased with our experience at Gecko Garden Preschool. Both of our children have been enrolled here.The focus on a play-based curriculum was what initially drew us to Gecko Garden Preschool, however it was the wonderfully happy relationships our children built with their teachers and peers which pleased us the most and which ultimately has made their lives in Phnom Penh so enjoyable." "We chose Gecko Garden Preschool because many friends recommended it but, even then, I wasn’t prepared for how much it would impress me. The teaching staff are dedicated and caring beyond belief and my son is so happy there. He spends all his time playing and having fun yet he’s also constantly learning – not just his abc’s and his 123’s but life skills too." "Thank you Gecko Garden Preschool for providing my daughter with loving and caring teachers who have many years experience with children. On my daughter’s first day she walked in with her head down but came out with confidence! Most importantly she is able to interact with other kids from different backgrounds and cultures. It’s a wonderful place for preschoolers to experience learning from a young age." "My kids are really happy to go to school every day. They cry when they are sick and not allowed to go!"